In his latest column, Matt Carr argues that Europe's obsession with preserving the single currency through brutalist austerity politics threatens to de-rail the European Union itself. European governments tend to present ‘austerity’ as though it were an inevitable and unavoidable response to a natural disaster, and many have used the economic crisis as an opportunity to enact a privatisation programme that would once have seemed like a utopian fantasy to the neo-liberals and Freedmanites of the 70 and 80s. These policies have been pursued with a sublime indifference to their social consequences. Few people will need reminding that Greece is now in the midst of its most profound social crisis since the Axis occupation of World War II, yet both the ‘troika’ and the Greek coalition government are united in their insistence on even more draconian cuts programmes. In Spain the consequences of austerity have been no less traumatic. National employment is currently at 26 percent and rising, and over 50 percent amongst 18-25 year olds. Young people in Spanish cities can now be found searching through trash cans for food, hospital wards are closing and elderly patients are having to leave private nursing homes because their families cannot afford to pay for them. Elsewhere in the continent, austerity-driven cuts programmes have fallen most heavily on the poor and vulnerable, while simultaneously creating poverty and vulnerability where it did not exist before. The acquiescence of Europe’s politicians in this slow-motion car crash has been truly shameful. Unable or unwilling to confront the financial institutions that have done so much to cause the current crisis, governments across the continent prefer to proclaim their willingness to take ‘tough choices’ as a badge of honour. Rather than defend the social democratic gains that were made during the Cold War in the form of public health and education services, even left-of-centre politicians opt for ‘slow austerity’ in order to please the financial markets, or strike pseudo-radical poses in opposition only to become converts to economic ‘realism’ when they get into office. The cowardice of Europe’s politicians is coupled with a mixture of arrogance and complacency. With the democratic process effectively subservient to the manic-depressive fluctuations of the stock markets, the continent’s political classes appear to take it for granted that no matter how bad things get, opposition to austerity can either be channelled into manageable tributaries or suppressed with rubber bullets, water cannons and police truncheons. The governments that rely on such methods and the technocrats in Brussels who indirectly support them, seem to assume that ‘social unrest’ can be contained and that the majority of the population will accept the ‘there is no other alternative’ narrative that has become a mantra of the new economic brutalism. Such complacency and indifference is not only morally contemptible: it is also astonishingly shortsighted. Because there are alarming signs that the crisis is beginning to pose a wider threat not just to the single currency, but to the political ideals on which the European Union was founded. The project of European unity emerged after World War II as a response to the most destructive period in European and world history. After two decades of wars, dictatorships, racism, and genocide, its architects set out to create a new Europe, with democracy and human rights at the core of its political identity. In the grand vision of Jean Monnet and Robert Schumann, economic integration and prosperity, shared political aspirations and pan-European solidarity would lay the basis for common prosperity and a new moral and political order. Today, this version of Europe is increasingly at odds with the political forces that austerity and economic crisis have unleashed across the continent. In Hungary, economic stagnation has fuelled support for the fascist Jobbik party, which gained 17 percent of the vote in 2010. In Greece, the neo-Nazi Golden Dawn has become the country’s third largest political party. In addition to terrorising immigrants on the streets, its members have now become an auxiliary police force in some urban neighbourhoods, where they provide ‘security’ and social services to the elderly that ought to be the preserve of the state. In France, Marine Le Pen’s National Front is mostly likely to gain from the increasing unpopularity of the Hollande government, with a programme that is not only anti-immigrant, but opposed to ‘globalisation’ and the European Union. In the UK the xenophobic Europhobes of UKIP could conceivably become part of a coalition government. In Spain, a surge in popular support in Catalonia for independence has prompted threats from senior Spanish military officers that separatist activity will be regarded as treasonous and unconstitutional. These threats are not to be taken lightly. In Yugoslavia, the radical IMF-enforced restructuring of the economy during the 80s and 90s was a direct contributing factor to the Yugoslav civil wars. The Spanish armed forces have long seen themselves as the guarantors of the unity of the Spanish state, and the military coup that began the Spanish Civil War was partly intended to reverse a move towards Catalan and Basque regional autonomy that the army feared would lead to a break-up of Spain. The rise in separatist sentiment in Catalonia is partly a result of the economic crisis, which has fuelled the resentment of Spain’s richest region at the financial contributions it makes to central government. With the Catalan government now calling for an election in November that is a de facto referendum for independence, the stage is set for a confrontation with a potential knock-on effect in Spain’s other autonomous regions. In periods of severe economic crisis, people inevitably turn towards radical solutions or pseudo-solutions, particularly when mainstream politicians fail them. In the 1920s and 30s Europeans across the continent turned to fascist, extreme-nationalist and authoritarian political movements not because they were forced to – at least at first – but because they had lost their faith in liberal democracy and in their politicians. 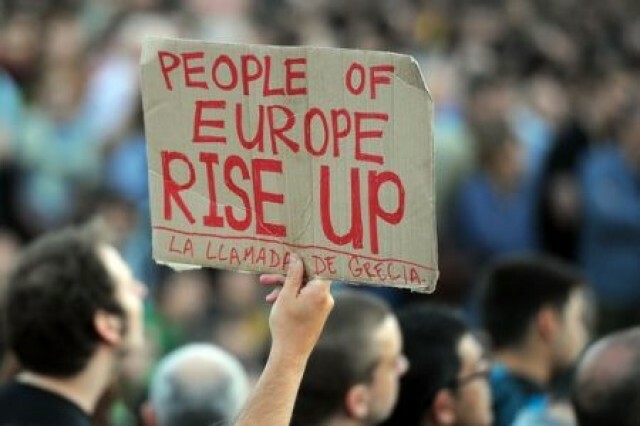 Europe’s austerity politics now threaten to bring about a similar disenchantment. For democracy to flourish, governments need to convince their electorates that their lives will get better, not worse, and offer them something more than vacuous talk of shared sacrifices that are not shared at all. If European solidarity is to be something more than a bad joke, then it requires more than bailouts for banks and shock doctrine economics enforced by the police truncheon. And if not, then the technocrats in Brussels should not be surprised if increasing numbers of Europeans choose to abandon the governments and the institutions that have so comprehensively and cynically abandoned them. Without disagreeing with the general thrust of your piece, i’m not completly sure it’s got that bad yet. Though if it hasn’t, it surely will while this austerity madness continues. I think it has got that bad. I based that reference on a report I read a few weeks ago (can’t remember where) suggesting that young people in some Spanish cities were indeed doing this – not en masse obviously, but the fact that such things are taking place at all is indicative, and would not too long ago have been unimaginable in Spain.